Everywhere you hear and read that companies are threatened by disruption, digitization, shortage of skilled workers, complexity. The latest methods of process optimization, alternative forms of organization, better employer branding, agile leadership or even AI for selecting candidates and the necessary transformation are the answers to the threats. I do not deny that these solutions help in individual cases, but is there not a fundamental problem? What do we experience in the companies? In many companies today changes are still being ordered – you have to change! As recurring projects, usually with the goal of automating processes or implementing new software. Every second year we „reorganize“ – sometimes the products are in focus, sometimes the customers. A lot of money and time is invested, with little success. On the contrary. In most cases, these processes of change leave scorched earth behind. But how are employees prepared for the constant changes and increasing demands? Where do they get sufficient support and empowerment? Before, during and after the changes – after the change is before the change. Companies often lack the necessary skills, competencies and values. Are there opportunities for empowerment within the work processes? Wouldn’t it make sense to prepare employees today for tomorrow’s changes? I talked to Alfred Remmits about this. He is the founder and CEO of our partner company Xprtise, an international learning & performance organization. 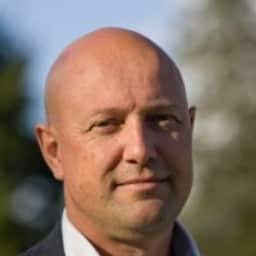 Alfred Remmits has been the founder of several companies in the world of Learning & Performance Support, including one of the largest IT training companies in the Netherlands in the late 80’s and one of the leading Global Performance Support companies in early 2000. Alfred is also the founder and CEO of Xprtise, a global learning & performance organization focused on the implementation of large Performance Support and Adaptive Learning technologies, based on the 5 Moments of Need methodology. Alfred is a regular speaker at learning events and is recognized internationally for his views on 70-20-10, Performance Support, Adaptive Learning and the topic of “Big Data in Learning & Development”. Alfred has a master degree in Social Science from the University of Amsterdam and lives in the Netherlands. What role does L&D play in the future of companies? Remmits: I believe that the role of L&D will become more important in the future of companies, because managing the key-assets of the companies, being the employees, will have more focus within organizations, because of the speed of change that organizations and their teams have to deal with. We have move into an era of “continuous change”, which means that we have to put much more energy into “continuously ups-killing our employees to cope with this continuous change”. Companies that fail in that process of being adaptive to change and being agile as a whole, will lose in their very competitive markets. Examples like Kodak, Nokia, Blockbuster and recently Toys4Us are interesting examples of organizations that didn’t adapt to the changing world and went out of business. Talent- & skills management will become continuous processes and will need to be adaptive and agile, which means that the HR- & LD organizations will become more important than ever before. What is special about the „5 Moments of need“ method? Remmits: Organizations are realizing that the traditional focus on classroom- and eLearning training modalities are not enough anymore to cope with the need to continuously train and upskill their employees in this agile world. The “10” alone is not enough anymore and therefore are many organizations moving into a 70-20-10 approach to support a continuous learning journey for their employees. The problem is that many organizations struggle with the “70” in the 70-20-10 model, as they are not skilled in the design & development that is needed to build learning solutions that fit in the full 70-20-10. Nearly all our L&D professionals are very well skilled and trained in the 10, where they have learned to design and develop great classroom training and eLearning solutions that support the 10, based on the traditional ADDIE design & development methodology. The 5 Moments of Need methodology is first of all an agile design & development methodology, created to support the design & development of the complete learning journeys of our employees, in fact the full 70-20-10. The 5 Moments of Need methodology is the only proven methodology that starts with the support of the employee in the workflow (the 70) and extends this into also the 20 and the 10! How should learning arrangements be structured so that learning is possible? Remmits: All learning arrangements should start with the “Why” and not with the “How”. We still see that our internal clients come to our L&D departments with the “how” already prescribed, where they are approaching us L&D-ers with the solution in mind. Questions as: “I need a 2 day training for my sales-team” or “I need 4 hour of eLearning for better communication of my managers” are typical examples of this completely wrong approach. They should come to our L&D departments to have a discussion on “Why” things are not working, “The problem first” and from there work with L&D to define the KPI’s that need to be achieved to resolve the problem and from there work in partnership on defining a solution that will target the defined KPI’s. In which industries can Workplace Support be used in a meaningful way? Remmits: Performance Support works in every industry, from government, factories, service industries, healthcare, entertainments, etc. We have done projects that support call-center employees, managers, factory-floor employees working on machinery, sales- & marketing employees, customer service employees, planners, construction workers, nurses / health care, etc. How do hospitals in the Netherlands use the 5 Moments of Need? Remmits: Hospitals worldwide are seeing that information on procedures in healthcare, approaches to health, medicines, materials, equipment is changing faster than ever before. Hospitals now understand that they need to train their staff continuously and that classroom training only is by far not enough, unless they would have the time to put their staff at least 1 or 2 days a week in a training; they simply don’t have that time let alone the budgets to do that. So they are adopting new approaches to training and also coaching their staff in the workflow and they start building solutions that support their staff at the “moment of need” in the workflow. Also the hospitals were looking for a good methodology to design and develop these “workflow-oriented” learning and support solutions and most of them have now adopted the 5 Moments of Need methodology as the core design & development methodology for these type of solutions. In the Netherlands we now have created a 5 Moments of Need course specifically aimed at L&D folks working for hospitals. Is it only worthwhile for large companies or also for SMEs? 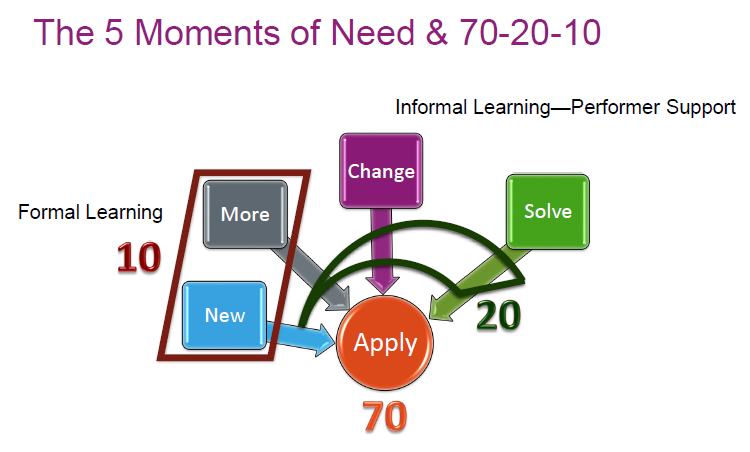 Remmits: The 5 Moments of Need methodology is worthwhile for any organization that want to support their employees in a more agile workflow oriented way, supporting the full 70-20-10 learning journey. We see organizations as of 100 employees starting to work with the methodology. What do companies have to consider during the design and implementation? Remmits: Companies need to realize and communicate to their teams, that learning in the future is not only about classroom training and eLearning anymore, but in most cases a blend of different modalities, including support of their employees in the workflow. They need to realize that this requires another methodology of design & development and another set of technologies (performance Support and Adaptive Learning technologies) to support learning in the workflow. Finally they need to realize that governance and content management are becoming core processes and skills for their L&D organizations in the future, combined with strong data analytics skills. Is there a way to measure the performance increase by 5Mon? Remmits: In modern learning & performance solutions, the focus needs to be on solving business problems, based on clear KPI’s. As part of the overall solution, a clear measurement strategy focused on measuring the effect on the defined KPI’s need to included. KPI’s are for example related to increase in sales, decrease in production problems, shorter call-time, better retention of staff, etc. As stated before the skill of good data analytics is becoming important in the modern L&D organization, to ensure that data is well defined and interpreted as part of the overall solution. this requires good data analysis and meaningful KPIs! What prevents those responsible from breaking new ground at L&D? Remmits: Traditional thinking (we have always done it in this way, with great classrooms), fear of change in the organization, but also in the L&D department, not the right drive to change, lack of change management skills and lack of leadership. What advice do you give employees in L&D departments when they want to introduce the „5 Moments of need“? Remmits: Understand the “Why” of this change and really start to understand and learn the skills needed to deploy 5 Moments of Need projects. Like we had to learn the ADDIE design & development methodology in our former education to become great designers and developers of classroom training and eLearning, now we also need to educate ourselves and sometimes even re-educate ourselves in this new methodology. We also need to understand that we need to invest as L&D team in adopting this methodology. Furthermore we need to understand the “Communication of this new approach” will be a core aspect of making this a success. Our leaders and our employees need to understand why we are doing this now in a different way and also what this means for their day-to-day work. Learning is now becoming a part of the day-to-day work routine. Do we need digital learning and are face-to-face events still necessary? Remmits: Yes, face-to-face events and traditional eLearning are still part of the overall solution, being the 10 in the 70-20-10 approach, but will be less dominant than in the “old” approaches where “10”was the leading factor. On average we see the amount of classroom training and eLearning being reduced with 50-75% in organizations that have adopted the 5 Moments of Need methodology. How do we let the skills mature with which one can solve problems in a self-organized and creative way? Remmits: By making this part of the overall training program. We need to train our employees in the usage of Performance Support technologies and Adaptive technologies, so that they can self-serve in the workflow. Manager also need to be aware of the tools and approaches that are developed to assist their teams in doing their job and understand that these are an integral and important part of their job and need to be promoted and managed. How do we prepare people for jobs that do not even exist at the moment, and how do we prepare them for the use of technologies that are still being developed? Remmits: Continuously inform our employees about the fact that our world is changing because of the amount of information coming to our organizations and therefor our jobs and employees, We need to be open and honest about the fact of “continuous change” and understand that most people are not used to this and even in many cases don’t like change at all. We need to preach a future of continuous change and that the only way to survive is to adapt to that continuous change and that the organization and leadership is willing to invest in supporting their employees to cope with this process. Communication is key! Is it possible to develop competence and value through the „5 Moments of need“ and if so, how can this work? Remmits: I believe that the 5 Moments of Need is the only methodology available in the world of L&D that can cope with the need of continuous update of competences. Not sure if that is related to values to, as I see this more as a required communication process needed to have your teams adopt to the continues change in this new world. How do you see the development of gamification and serious games for continuing vocational training? Remmits: Gamification and serious games will play an important role in situations where it is difficult to train people in the real stressful environment, like in the military, police, fire brigades or with regards to complex situations and machinery. But for me these are all just tools and again will need a good design & development methodology to ensure that these are used at the right moment of need. They are just tools and nothing more. For some time now it has also been possible to learn the method in an online course and to implement it in an individual project. When will the next „5 Moments of Need“ certificate programme take place? Thank you Alfred, for the interview. demonstrate the relevance and possibilities of the method for supporting and empowering employees in organisations. Previous PostVeränderungen - steht sich HR selbst im Weg? Next PostPerformanz steigern und auf Zukunft vorbereiten?